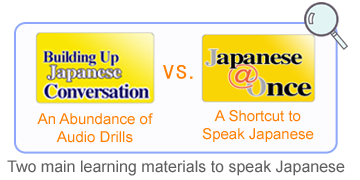 Building Up Conversation was developed to help learners master basic conversation skills in Japanese. This material covers from the basic level to the lower intermediate level and within this range, much frequently used sentences and expressions are carefully selected and compiled. When you analyse each conversation, you will find that the conversation builds up using only simple and short sentences. None of these sentences is complicated at all, yet you can have a conversation, even about a complicated subject, by building up simple, short sentences. Building Up Conversation helps you acquire the ability to go with the flow of conversation, even about a complicated subject, by learning how to build up simple and short sentences through audio drills. This material includes three levels. Includes 3 script editions, Romaji, Kana and Kanji. You need to connect to the Internet.